A long time ago, in a cottage with a mossy roof and ivied walls; a place that spoke of Gods gone mouldy, with rotting rooms in sunless shambles, two girls were born into a world of silence. Orla, a Petite Fig by Fig and Me. In her linen dowry. Two girls, more pale than thistle down, with a full head of bright red hair. They came into the world roaring like a rodeo. Making their arrival known all the way to the village, even though their cottage was laid so far from the hustle & bustle of humankind. Such cries of scandal. Their mother, feather soft in her movement, with pools of light instead of eyes, just carried on with life. Much to her own children bewilderment, she dressed them, fed them, and wrapped them tight. "I shall name you, Maggie. 'Cuz you the eldest, the brightest, with your deep blue eyes that remind me of the bottom of the ocean. Maggie it is." "And you, my very precious, your name shall be Orla, with your pepper eyes, and your smell of ripe grass. Yes, your name shall be Orla." The babies repudiated this first betrayal, surely they ought to choose their very own names. But their mother stuffed them tight in between her blankets and they all fell asleep. Maggie, by Fig and Me. A natural fiber art doll. This devious attitude towards life did not diminish with time. They became slippery, rogues, avengers. Maggie and Orla grew wild, shabbily clothed mostly, trying to sneak inside all manner of hollows, human or animal made. They considered themselves medieval witches, and searched high and low for warty toads. They hunted, scavenged, foraged and made their mother blooming mad. They usually came home, smelling of wolves, covered in God-only-knows-what, while their Mother started the daily slow torment of making them wash. Turning their pockets inside out usually yielded all manner of surprises: half-eaten raw turnips, roasted potatoes wrapped in cabbage leaves, jewelry made out of brambles, marmalade jars full of moths, burdock tips, shiny smooth pebbles, stubby bits of pencil, a faded advertisement or two. The children were so fond of collecting these oddities. Their mother knew how much it meant to them, and so it was hard to prune such riches. With her natural wisdom she tried to make arrangements, subpoenaed witnesses to testify, made promises. In the end, the scoundrels always won. Their cottage was full of measured amounts of treasure, garbage, and out right insolence. Orla, by Fig and Me. 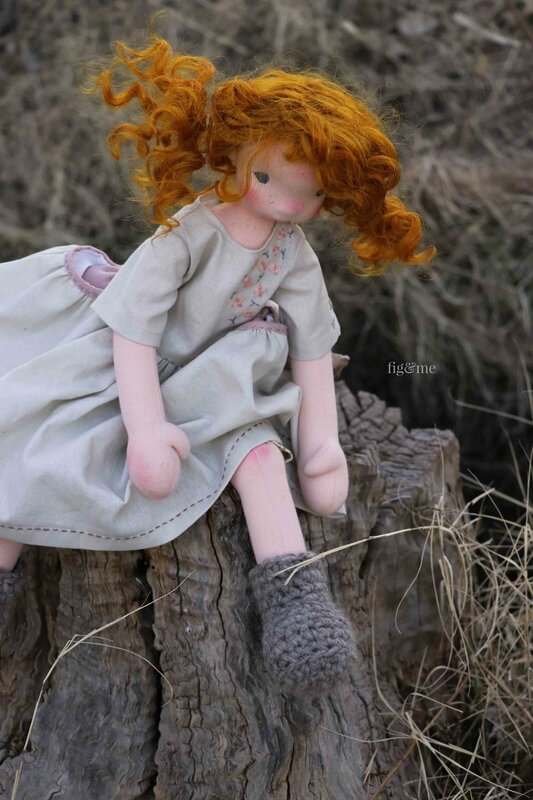 A natural fiber art doll. They always woke up at the break of dawn. While the village slept, tucked under their blankets, Maggie and Orla got ready to start they day's adventures. If there were crows on their fence, they considered them good omens. Witches and crows are friends, they reminded their mother. Trying to tame their russet curls was not for the faint of heart. Mother always complained their hair looked like a pigeon loft. The girls always rebuked that there was more to life than personal hygiene, to which she pronounced against with abject despair. In the name of goodness, and trying to keep quiet their demented mother, they always tried taming their red anarchy. A ribbon here, a pig tail there. Their jolly laughs were heard while they supped their breakfast: thick porridge, salty-buttered toast, sometimes even fine fruit cakes or thick cream custards. Donning their many layers, out they went. Not to return home until the stars were starting to flicker, such sun worshippers you never knew. 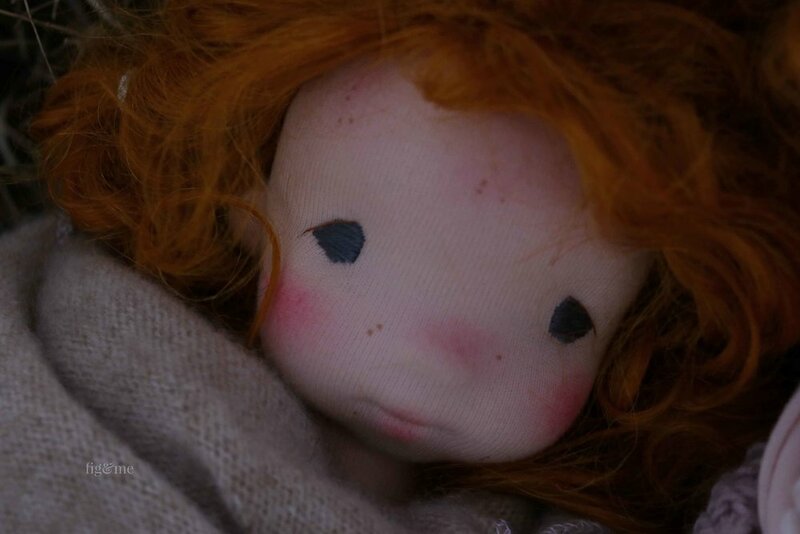 Maggie, a natural fiber art doll by Fig and Me. Maggie and Orla grew up, in a world were children are left to their own devices. Larking about, finding their place in life. Rosy with health, with poor civilized behaviour, scattered-brained rapscallions. Their mother, twice blessed, couldn't put up a decent fight. 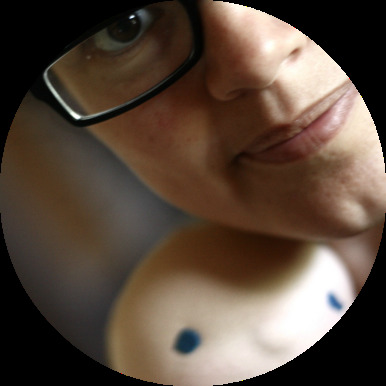 Instead of turning a horrid beetroot colour, she decided for spotty parenting at best. Good nourishing food, clean dry sheets, and a positive outlook was all this warm-hearted realist could muster. Their children attended her ministrations, but with true cheerfulness they went about their merry way. Once the earth was warm and friable, they considered it a personal invitation to live outside. As the seasons fermented their witchery concoctions, tucked away in nook and forest, they would bring them home with such evident relish that their poor mother had little alternative but to keep astringent comments at bay and proceed to display the bearing gifts with practical christianity. Such is the life of a mother. We tend with every day civility the barmy confections of our children. I do wish I could live Maggie's or Orla's life. A partner in all manner of scoundrel activities and proclivities. Someone to support heroic journeys, devise small ploys to fill pools with frogs, go trough times of plenitude, padding softly on wet grass, on a life pilgrimage to discover ancient magic. But since I cannot, I will live through them, and instead make dolls. Naturally, I have had such fun time creating these two. Not just because every stitch was made in commemoration of their rascally ways, and every curl fussed proper. Every freckle kissed, and every rosy cheek gingerly caressed. I love my dolls, and I think you know why. I am here to offer these two up for grabs. It pains the heart to say good-bye but it cannot be avoided. Such is the life of a dollmaker, right?. We have to see them go and live their lives. 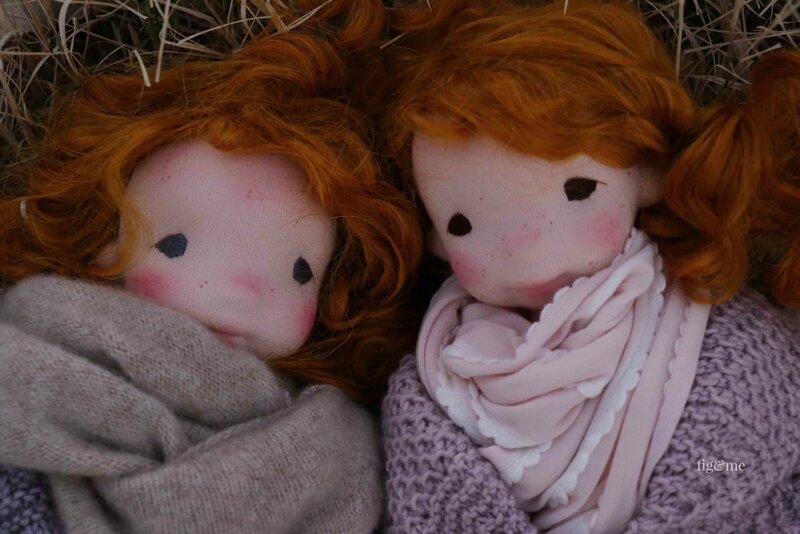 Maggie and Orla are two natural fiber art dolls, made in my Petite Fig pattern. They are a little over 19" tall. Their light skin is sensitive to light, so please dress them accordingly. I have given them freckles all over their body, and I have sculpted for them beautiful round bellies (full of thick cream custard?). Both dolls have heads sculpted entirely in wool and needle-felting, with embroidered eyes: one has blue, the other deep brown. They are stuffed with clean, Canadian wool. Maggie and Orla both have curly red (weft) goat hair, sewn to a wool cap. Their legs have a three-part wool system that allows them to be gently bent, and then put back into straight leg position. Such clever girls! Orla, by Fig and Me. Linen doll clothes by Fig and Me. Orla wears cotton jersey underpants, a calico underskirt and a beautiful (if I may say so!) linen dress with oversized patch pocket. Her dress has shabby embroidery stitching troughout. Orla also has a handknit heart warmer made in cashmere and wool yarn, and a fabulous cotton jersey scarf. Her shoes are made of wool and have long ties. Maggie in her linen dress, by Fig and Me. Maggie, the rapscallion. Natural fiber art doll by Fig and Me. Maggie wears cotton jersey underpants, and wooly boots. A calico underskirt and a very long and wide linen dress, also with shabby embroidery stitching throughout. This dress has very wide, lined pockets. Her knitted heart-warmer was made with cashmere/wool yarn and she likes to tie it at back, but you can be the judge of that. Her italian cashmere cowl has been fashioned of repurposed fabric. 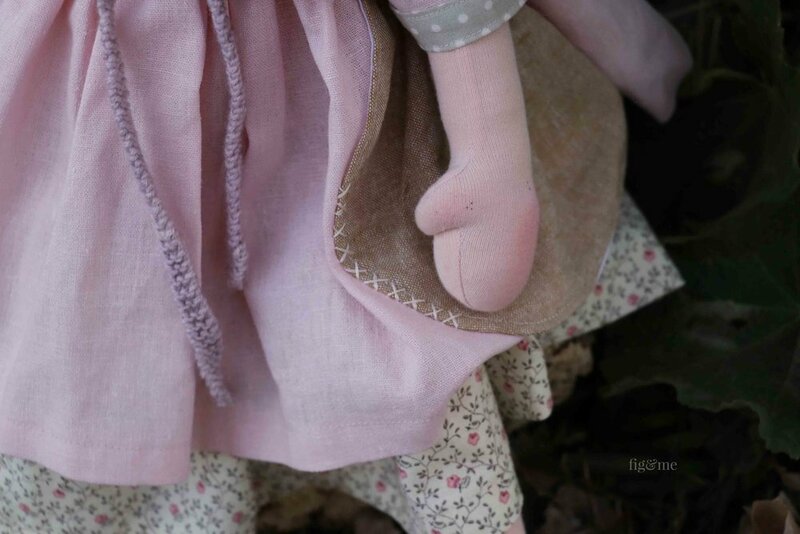 Details of doll clothing, by Fig and Me. Orla by Fig and Me. Natural fiber art doll. If you would like to bring either of these girls home, please enter your details in the form below. You can try for one or both, we will leave that up to you. Please only enter if you are personally interested in bringing them home, not on behalf of someone else. Their price is $1350 USD each plus postage ($30 US/Canada - International will need a revised quote). My dolls travel with insurance and tracking number in beautiful wrappings. Once the doll is shipped to you, I send a care file via email. I recommend these rascally dolls as suitable for older children (8+) or adult collectors. They are made with high-quality in mind but they need gentle play. This form will be open until Sunday March 4 at 9 PM EST (7 PM MST). At that time we will proceed to choose names at random to purchase each doll and Paypal invoices will be sent, which are due then. Orla, a little scoundrel by Fig and Me. art doll. Maggie, a little scoundrel by Fig and Me. art doll. Thank you kindly for coming to read my stories and for doting on my dolls. They are born sometimes in musty cottages, herbaceous borders, wooden nests, sun-lit parlours. Always under caring hands and surrounded by so much love. They all have a mission in life, to spread light, to make people soft, to enchant the imaginative soul, to entice doll play. Thank you for your time. If you are entering for one, or want to be like their mother "twice blessed", we wish you the very best of luck. For now, we retreat into their world. Full of thickets and small time criminals. Be right back. 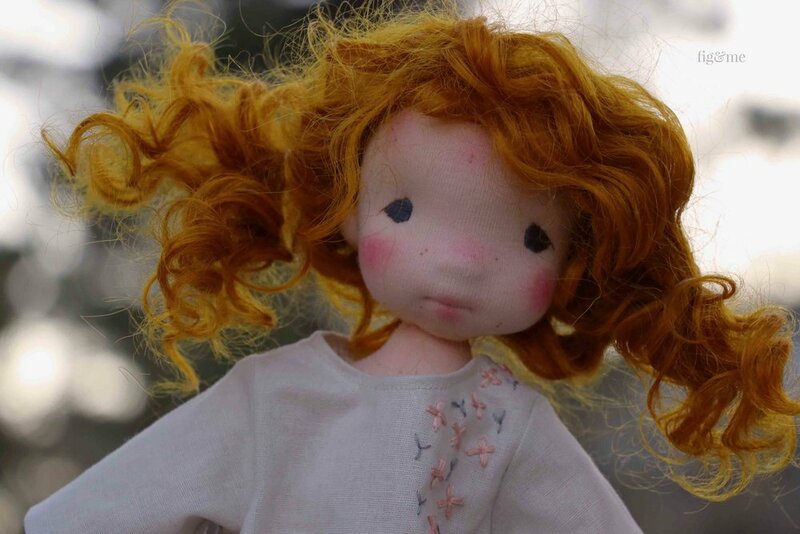 Maggie and Orla are two natural fiber art dolls by Fig and Me. They have a lovely story to tell, come and read all about it. My shabby scoundrels: Maggie and Orla. Art dolls by Fig and Me.